A dream tool that helps vocalists stay in tune while singing, feel confident, and focus on the emotion of their performance, in the studio or live on stage. Waves Tune Real-Time provides smooth, natural-sounding vocal pitch correction instantly and automatically, as soon as the notes leave the singer’s mouth. Designed for live performances as well as pre-production, tracking and mixing in the studio, the plugin’s innovative pitch detection and correction technologies ensure that the tuned vocal retains the vocalist’s natural vocal sound. Producers, engineers and performers can use the plugin for subtle pitch correction, but also as a creative pitch quantization effect – all in real time. The intuitive controls, simple layout, and touchscreen compatibility are key for engineers who have little time to fuss around and need to quickly get solid and "ready-to-go" vocals. Waves Tune Real-Time can be easily programmed per song and customized to the singer's articulation. You can control the range, choose a scale, mark in advance specific notes to fix or avoid, control the plugin’s sensitivity, and even tune a singer's vibrato while preserving its natural movement. 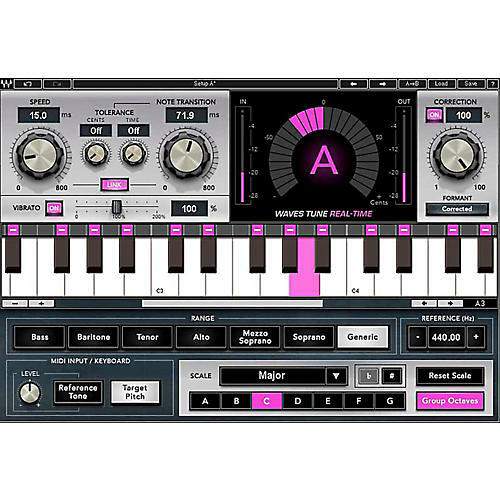 If you don’t know the scale of the song, you can enter the notes using the virtual keyboard, or set the plugin to follow a melody played in advance or in real time via MIDI.